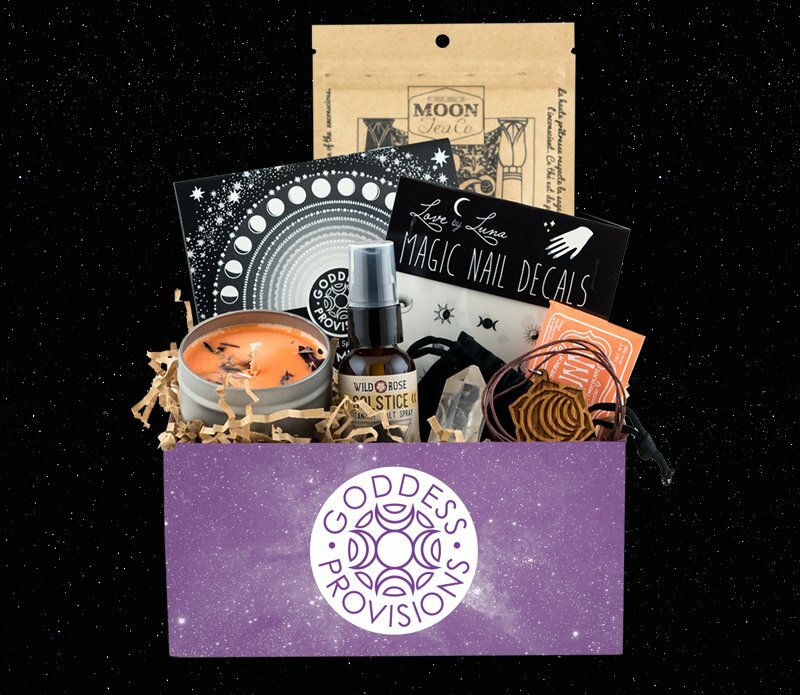 Our Solstice Box is packed with supplies to help you connect with and honor the light and dark within. Each box includes the following items. Please note the clear quartz will be replaced with a surprise crystal. This custom laser etched necklace is exclusive to Goddess Provisions and houses a lotus sun coexisting with the phases of the moon to represent the union of light & dark, yin & yang, masculine & feminine. Wear this close to your heart as a reminder that you are whole. Enhance the divine feminine energy in your sacred space with the illuminating aromatherapy and radiant glow of this soy candle dressed with lotus, hibiscus and cornflower. Treat yourself to this 70% stone ground vegan chocolate. It will be a surprise to see if you get the luscious MoonJuice bar made with maple crystals, salt and can jaggery or the invigorating Maui Sunrise bar infused with Hawaiian ginger and red turmeric. Sip this heavenly herbal tea featuring organic spearmint, raspberry leaf, lemon balm, hibiscus and rosemary to awaken your senses and soften into your inner wisdom and highest truth. These super cute nail decals will make your manicure shine and offer the magic of the sun and moon to everything you touch. Use this harmonizing blend of spearmint, juniper and chamomile essential oils infused with pink himalayan salt as a room or body spray to refresh your mood, hair or skin. Keep track of where the moon is in relationship to the sun and stars throughout 2018 with this moon dial calendar and chart of phases, transits & eclipses. It'll be a surprise to see which crystal you get.